A server for video conferencing is available for no charge. Click here to enter the Graver Video area This resource is available for engravers and jewelers and those learning to engrave. The speed of the server should handle several hundred users' video streams at the same time. 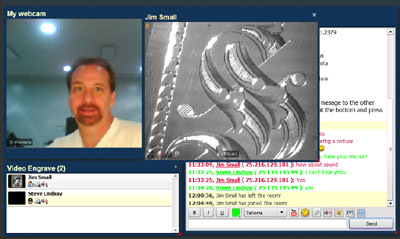 This service is intended to give the engraving community another way to communicate and help each other learn the art of hand engraving along with www.engravingforum.com With this server, provided by Lindsay Engraving Tools, the most limiting factor in video streaming for users is each user's internet connection speed to his or her home. How steady and fast of internet provider you have will determine the video stream speed you broadcast and receive. The graver video streaming can be used in several ways. It is the same as asking for advice on EngravingForum.com but with live streaming video. As an example, someone having trouble making a certain engraving cut could turn his camera on and make a post on the forum saying: "I am having trouble making a particular type of cut. I have my camera on and if some of you would watch what I'm doing while I take this cut I would appreciate your suggestions and help. Come join me in the graver video conferencing area. I am in room named... etc... "
As another example, if you are engraving on a project (or even just practice) and would enjoy sharing, you could make a new room in the video area, turn your camera on and post on the forum that you welcome people to watch and comment. Engraving, jewelry making, metal or wood carving are all possible methods that members of the forum would be interested in watching.